Castrating calves at the Hollenbeck Branding. It's a proven fact steer calves will bring a premium over intact bulls, so here is a look at various methods available to producers. Castration is the disruption of testicular function, usually by removal of the testes of male animals. And since ancient times has been a routine management procedure employed by stockmen, to prevent reproduction, simplify management and to improve marbling and tenderness of finished beef. Cattle can be castrated at any time, but research has shown that bleeding, infection and loss of weight are less in younger calves. A study at Texas Tech University found that calves castrated on arrival at the feedlot had more than twice the morbidity rate (17.5 versus 38.4 percent) of steers castrated early and almost double the mortality (4 versus 7.6 percent). 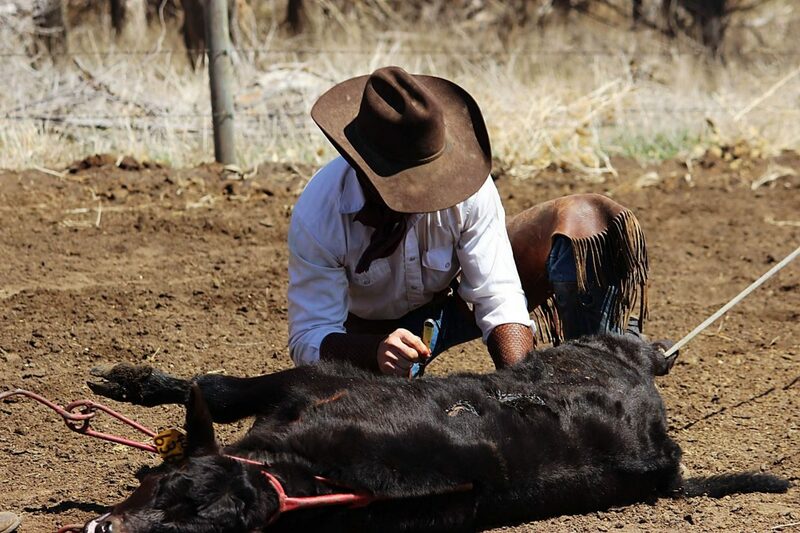 In most instances, cutting the bulls at branding or younger than 3 months old is best. 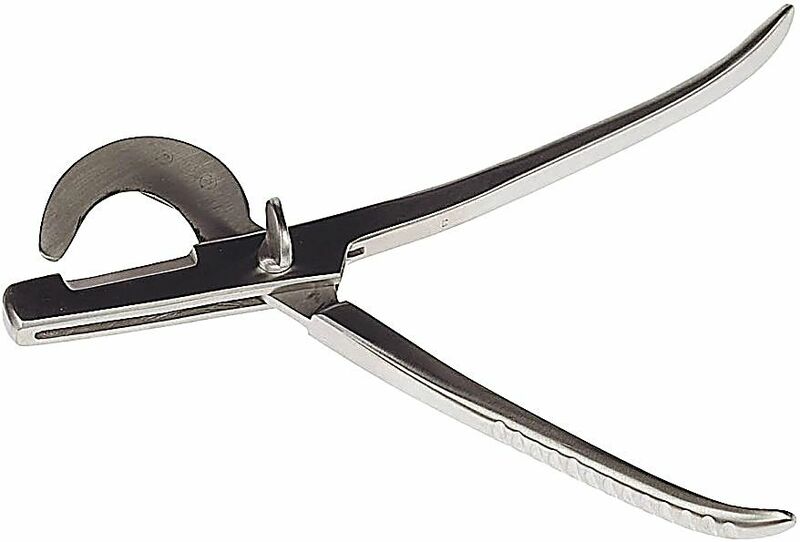 Methods of castration are generally divided into two groups, surgical or bloodless. The surgical method involves splitting or removal of part of the scrotum and removing the testes by knife or emasculator. Bloodless castration is usually done by using an elastic band or an Emasculatome. The band cuts off the blood flow to the testes and scrotum and eventually it all falls off. 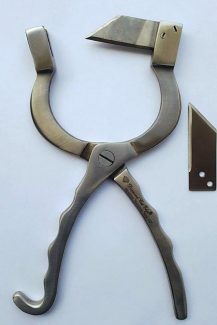 An emasculatome is a tool used to crush the spermatic cord, thus causing a loss of blood to the testes and eventual testicular atrophy within the scrotum. 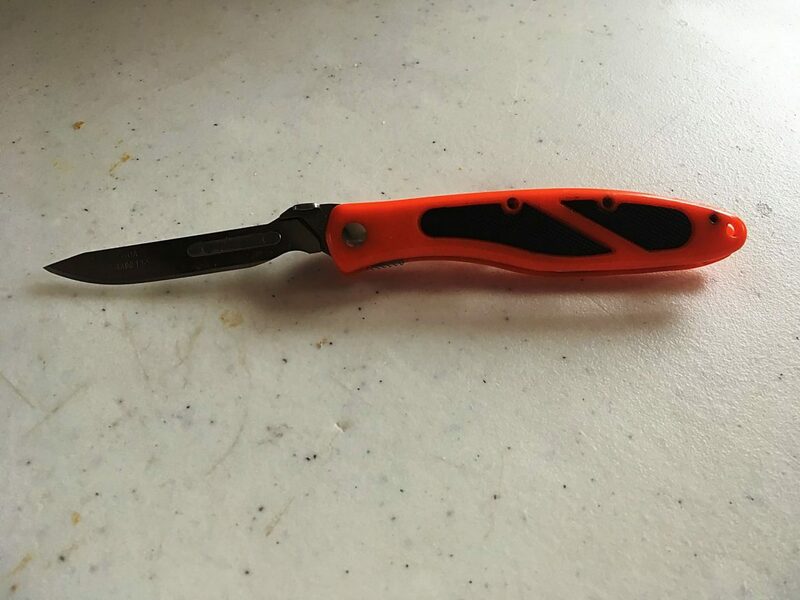 Surgical methods are really a matter of personal preference, a sharp pocket knife, scalpel or Newberry knife. Some are finding the Havalon knives with replaceable scalpel blades to be a very good option especially when processing large numbers, if the blade becomes dull or damaged it can be replaced quickly. The key to reduce bleeding, pain and improve efficiency is a sharp knife, so carry a spare knife or wet stone. 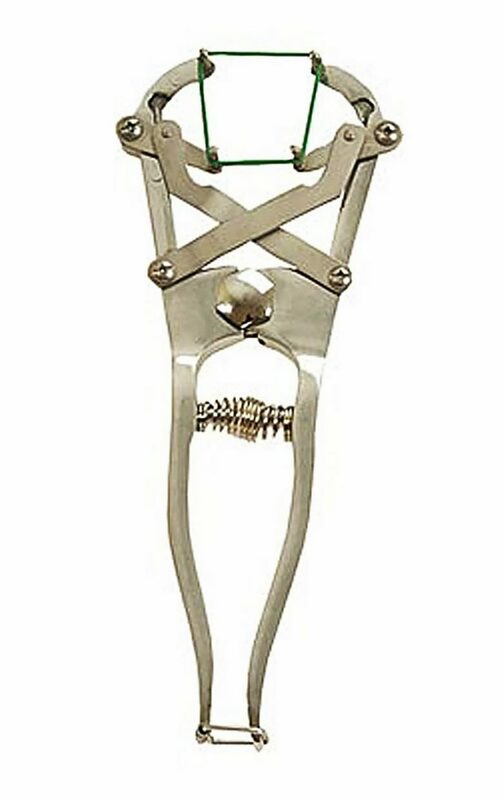 A Newberry knife is a combination of a knife and pliers, the knife splits the sides of the scrotum, allowing rapid access to the testes and good drainage. Some believe using a dull knife to fray but not cut the cord helps reduce bleeding. Surgical castration should be done on clean ground with the calves turned out on fresh pasture to heal. To avoid injury to man and beast make sure the castrator is capable and paying attention to their job. Once a calf starts to hemorrhage, they can be caught and the scrotum packed and stitched closed to slow blood loss but it is better to try and prevent the problem before it occurs. Correctly cut calves will have less weight loss and lower infection rates compared to other methods. This method is almost fail proof, sometimes with bands a teste can retract and not be noticed. Brigham Scott, DVM, of Cow Country Animal Clinic in Thedford, Neb., recommends cutting off the bottom of the scrotum or splitting it and pulling the spermatic cord until the muscle separates. "The stretching and pulling make the (blood) vessels smaller and helping it to clot better. With older, bigger calves I use an emasculator to crush the cord and reduce bleeding. Just make sure that enough of the bag is removed to allow good drainage. Take your time and do it right." He also recommends having an antiseptic solution to clean the knife and using it to wet the scrotum before cutting. Using a fly repellent spray is also a good idea. "Banding calves will hurt them for a longer time than cutting." Scott said. "Using a lidocaine block for pain management is an option, but it requires restraining the calf for a longer period of time waiting for it to take effect and increases the risk of injury to the wrestlers, the calf and increases stress on the animal. If ranchers are having problems or have questions, ask your local vet for advice." 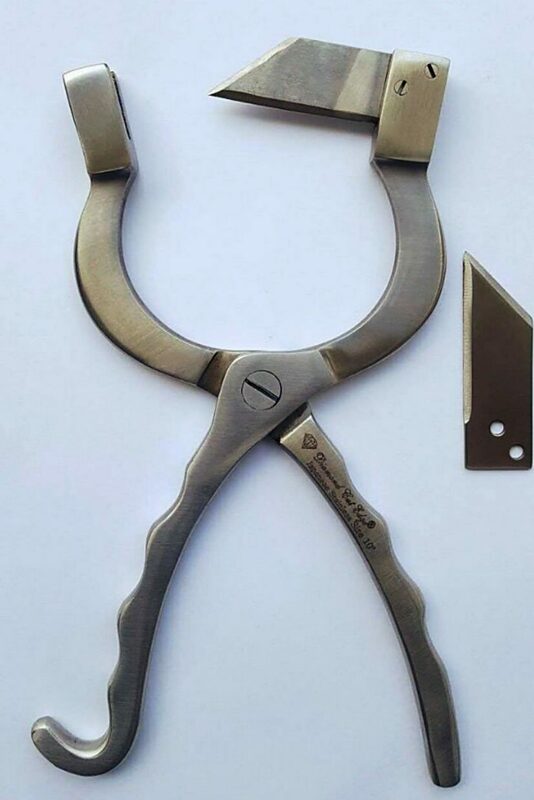 There are several different types of Elastrators available, the cheerio band type are used on young calves, generally before they are 24-36 hours old, but make sure the calf has sucked before castration because the stress can cause fatal results in newborns. Care must also be taken to be sure of proper placement of the band and that both testes are in the scrotum. Bigger Elastrators with heavier bands are employed for larger calves, often at weaning or later. Since it is bloodless, feedlots use it due to the dirty environment but caution should be used to watch for swelling in the scrotum. Removal of the bottom of the scrotum is advised to allow for drainage. Veterinarians recommend a tetanus shot with all banding because of the risk of infection. Emasculatomes crush the spermatic cord but don't break the skin so can be a better choice in fly season. They have a higher rate of operator error and aren't as effective on young calves who can still sometime retain their breeding capabilities.